At Magee, miracles truly do happen every day, and that is due in large part to the courage, tenacity, and vigor of the patients we have the privilege to serve. Each year, Magee honors a few of its most outstanding patients with the Patient Recognition Award. Selecting the recipients of this award is no small feat! Nominations begin in the fall, when therapists, nurses, physicians, and staff submit names of patients (discharged Feb. 2013- Feb. 2014) who achieved great outcomes despite many challenges and obstacles. The nominations are then reviewed by a group of clinicians who confer to announce the award recipients. The Patient Recognition Award goes to those who have demonstrated qualities that are considered an inspiration by fellow patients and staff, and they are involved in giving back to the community in some way. 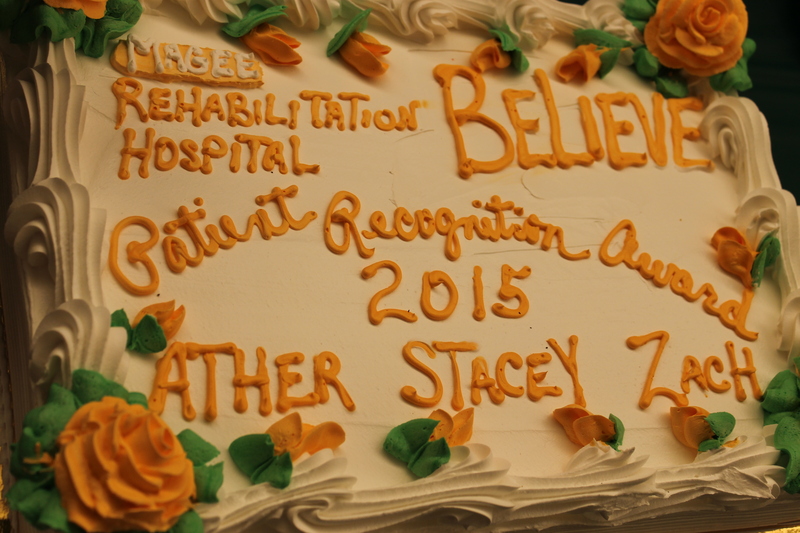 Congratulations to the 2015 Patient Recognition Awardees! At ceremonies on February 9 (Riverfront Outpatient Center) and February 13 (Main Hospital), the award recipients, their families, and current patients and staff gathered for a celebration complete with heartfelt speeches from a member of each former patient’s care team, engraved awards, flowers, and of course, cake. Mary, Zach, Stacey, and Ather all embody the “Believe” spirit that lives at Magee. They have demonstrated great advances in their own rehabilitation and have given back to the Magee family by inspiring others to strive toward their own therapy goals. Mary, a stroke survivor, is working her way back to the diving board with the support of her caring husband. Zach, who worked through transplant complications while still a high school student, was able to walk in his graduation and even became prom king. Today, he’s in college. Stacey, a proud mother and teacher, stood up and said “thank you” to her husband and family for their support, exactly one year since her stroke. Ather, a student at the time of his motor vehicle accident, is now using his computer science skills to lead the recently-launched EvoXLabs, which aims to provide an improved web experience for people with vision impairment and offer accessible websites and apps to local nonprofits. Congratulations, Mary, Zach, Stacey, and Ather! Melissa Jones, RN speaks to honor Stacey. Speech Therapist Rebecca Greenhow speaks to Stacey. Ather's Case Manager Sarah Myer shares her thoughts. PT Stephanie Friedman honors Zach. Zach poses with his nurse Badr Waheed. Stacey stops to thank her family for their support, exactly one year since her stroke.